UNITY - On sale NOW! 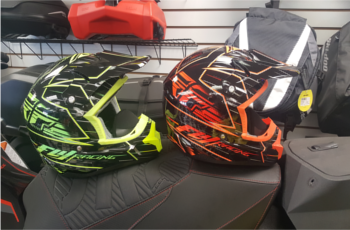 You will receive 1 $139 gift voucher to be used for the purchase of 1 Fly Racing Kinetic Snowmobile Helmet! Choose between 2 available colors and 2 available sizes. Chase Toys Inc is central Maine’s leading outdoor power equipment dealership located in Unity, ME. We are an authorized dealer for Ski-Doo snowmobiles, Polaris ATVs, Westinghouse Generators & Pressure Washers PLUS Husqvarna home owner and professional equipment. We offer the best lines in the industry and back it up with the best sales, service, and finance team in the state. So visit us today and speak with Ron, Josh or Brian about why our products are the best of the best! $139 gift voucher to be used for the purchase of one Fly Racing Kinetic Snowmobile Helmet. Available sizes/colors: 2 - XXL green, 1 - XL green, 2 - XXL orange, 1 - XL orange.